Without doubt titleist golf balls are the major brand name for golf balls. Performance and quality are their strongpoints and the number of professional golfers using titlest golf balls is quite high. Their consistent golf swings make the choice of golf ball and reliance on quality paramount. There is a strong company desire to provide professional and recreational golfers with the best most consistent golf ball products they can. Their ability to achieve this over time warrants their reputation. Every golfer is spoilt for choice at titleist. There is so much to choose from. The Pro V1x golf ball is a very popular choice. It features improved aerodynamics with a lower vertical flight but longer distance. It is a great choice for the harder hitters after increased distance, straight flight, whilst retaining a formidable stopping capacity on the greens. More short game spin and control with even softer feel, penetrating trajectory for exceptional distance, and long-lasting durability. The Pro V1 is a three-piece, multi-component technology with a very soft compression ZG process core, ionomeric casing layer, softer thermoset urethane elastomer cover, and spherically-tiled 352 tetrahedral dimple design. Aerodynamic flight tuning is a mojor development concern when making titleist golf balls. Boundary layer energy management and dimple desing greatly affect golf ball dynamics. The titleist pro v1 has a 392 dimple pattern design enabling its characteristics. Golfers need not concern themself with these details as the bottom line becomes apparent when used in action on the golf course. Titleist golf balls have won a huge number of professional tournaments over the last 25 years or so. This speaks volumes for itself. You will find a vast array of golf balls designed for different golf audiences. Titleist golf balls are certainly the most in demand. Unfortunately with demand comes price, and titleist golf balls are not cheap. The old adage “you get what you pay for ” is alive and well. When you factor in the marketing, the design, the research, then you will quickly appreciate why. You will have to scour around to find suitable prices. Can you justify the cost. You have to be realistic with your appraisal of your game to determine this. “here is no sense getting a ferrari for a 90 year old grandad, visually impaired in one eye , with a patch over the other, and asking him to go out and better michael schumacher”. The result will always be the same. Choose a titleist golf ball that matches your game. 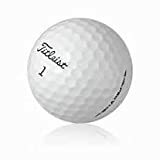 Are there any cheaper options to obtain titleist golf balls?. You are in luck here. Some people like to try the balls in the most inexpensive way they can. Your best option here is to try the refinished golf balls or mint used titleist golf balls. They come at a fraction of the price and give you an economical option to test the water. Still need some help finding golf balls. Mygolfbid.com.au are very agressive in their pricing and I have purchased of them before. I have no issues with delivery of quality of product from them. I contacted the owners to see if their golf balls were genuine. All products they sell passes through customs checks in two coutries before they can sell their goods, and they only source form reputable suppliers. That was enough for me knowing that at either of those checks could result in the goods being confiscated if they were not genuine. I figure they would go broke pretty quick if the goods were not real. Check them out.